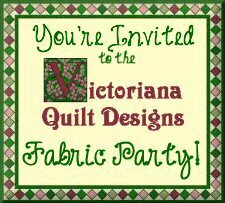 Cindy Simms Quilt Designs: Fabric Party Celebratation !!!!! I'd love to win one of Victoriana Quilting's memberships. I've been on the site a number of times. The help pages are great and the free download requests arrive quickly! I love VQD! Bonita has some awesome quilt patterns, tutorials, graphs and help pages! Her newsletter has is good too! Congratulations to Benita on her anniversary. She has a very informative site. One of the best things about Benita's fabric party is meeting all the new quilt bloggers! I'm putting you on my "blogs to follow" list! ...and winning a membership would be great too! Benita has some very pretty patterns. I am already a fan of Benita's website and patterns. She has amazing collection of free patterns. The fabric colors for Benita's Jacquard quilt really appeal to me, and it will be exciting to see what the fabric makers create. This is a new find for me, and I'd love to have a free membership to her site. I'd love to win a membership. I am a fan of Benita's too! I am excited to win a membership. I use this site for the many resources available. It has helped me many times, love the patterns.